The right replacement parts add value to your collectibles. Antique phonograph needles come in many types and sizes. Which you choose will depend on the era your phonograph was made and the type that it is. Which Needle Should You Choose? The specific material of your needle will make a difference in the tone you get from your player. If possible you should always try to replace a damaged needle with one of the same type. In that way your record or cylinder will sound like it did originally. The problem with this method is that any needles can actually cause minute damage which adds up over time. Eventually your record will not be good at all. You can choose to play your vintage music only rarely or to use a needle that will minimize the damage but not give a historically accurate sound. The best choice is to have a digital recording made for your listening pleasure and then keep the records and cylinders for display. This allows you to enjoy your music while retaining the value of your collectibles. Soft tone - Used to mute the sound for a softer, quieter tone. The manual players did not have volume control and this makes it a simple thing to control the volume of the music. The soft tone will also help to mask the buzzing that can happen with a scratched record. Medium tone - Can be harder to find than either the soft or loud. They are exactly as they are described, in between the soft and the loud. Loud tone - Work best on records made prior to 1920. Using these antique phonograph needles allows you to hear a louder version of the music. It is important, since you are often working with one-of-a-kind antiques, to change the needle after every one or two plays. This will keep it from damaging your record with a dull needle. Since the needles are not expensive it is easy to keep many of them on hand. If you have a phonograph without volume control consider keeping all three types of needles on hand. Diamond needles or stylus were used on phonographs made after 1950. This type of stylus was better suited to the new vinyl records being produced and gave a cleaner sound. It often came with a diamond side for 45s and 33 1/3's and you could flip it to the sapphire side which worked well on 78s. The sapphire needle will usually be good for about 75 full length album plays. The diamond stylus will often last for 150 or so full plays. Antique Needles stocks steel needles for use on phonographs made before 1920. They have both the soft and loud tone needles, as well as other items to help you restore your player. Victrola Repair carries steel needles as well but they have a medium tone needle to give you three choices on your sound. The needles are all for record players made before about 1920. D.B. Electronics carries needles for antique phonographs on up to the record players that are merely vintage or retro. Everything from steel to diamond stylus needles are available here. 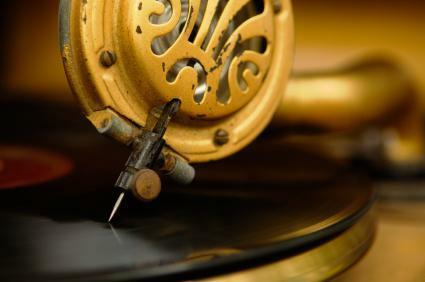 Finding the right needle for your antique phonograph is an important part of keeping both your antique player and your vintage records at their best.